Partick Thistle moved into the top half of the Ladbrokes Premiership thanks to a 2-0 triumph over Dundee - their first home win since the opening day of the season. 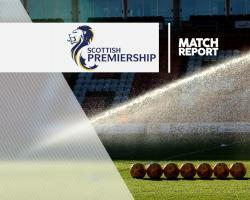 First-half goals from Callum Booth and Kris Doolan earned Thistle their first Firhill victory in nine matches and ended Dundee's seven-match unbeaten run in Maryhill. They were well worth their victory with a mature display and bagged a first clean sheet in 10 games in the process. The defender insisted he got a touch on the ball before tripping the Thistle striker but referee Alan Muir gave a free-kick and Booth sent a powerful curling effort rasping into the top corner. Tom Hateley was too high with a free-kick at the other end and Dundee were lacking a cutting edge as Thistle sat in without danger. And the Jags began to pick off their opponents towards the end of the half. Ryan Edwards lost then won the ball just in front of his penalty box before embarking on a run that took him to the opposite end of the park, where he slipped in Chris Erskine, but Scott Bain was out quickly to block the resulting shot. Again Bain saved his effort but Doolan reacted quickly, took the ball round the goalkeeper and squeezed the ball inside the near post to make it 2-0 a minute before the interval. The hosts came out for the second half in confident mood and only some poor final balls stopped them carving out more chances. Erskine came close from 25 yards as Thistle continued to dominate but Dundee could not be discounted after coming from two goals down to beat Hearts on Friday night and Kevin Holt found himself bearing down on Tomas Cerny after a solo run, but could not beat the goalkeeper. Edwards continued to shine but Thistle could not make the most of their second-half possession and they survived some late aerial pressure as Cerny made comfortable saves from headers from Marcus Haber and substitute Rory Loy.